For observers concerned about a resurgence of the far right, the AfD’s showing in Germany’s election raised alarm. The anti-European Union, anti-immigrant, anti-Muslim Alternative für Deutschland will join the Parliament, or Bundestag, as the country’s third-largest party, with nearly 13 percent of the vote. Only Angela Merkel’s Christian Democratic Union – which forms a parliamentary bloc with its Bavarian sister party, the Christian Social Union – and the Social Democratic Party did better. However, both the CDU/CSU and SDP lost significant voter share. To a historian of 20th-century Germany like me, the appeal of such provocations is shocking – partly because of the achievement of earlier German generations. Despite the temptation to paper over their ugly history, Germans have created a positive national identity based on a difficult reckoning with their own past. Germany now faces the dual challenges of an open attack on this consensus and a weakened party system which itself has uncomfortable historical echoes. If anything, postwar Germany is a latecomer to radical right politics. The National Democratic Party, founded in 1964 and often described as a neo-Nazi organization, never managed to gain seats in the Bundestag. By contrast, the French National Front and the Austrian Freedom Party both had their breakthroughs in the 1980s. The Netherlands’ Pim Fortuyn founded his xenophobic party in 2002; today, Geert Wilders carries the far-right torch there. Right-wing populist Viktor Orbán became prime minister of Hungary in 1998. The recent elections still show less support for radical-right candidates in Germany than in recent multi-party elections in France (21.5 percent in April 2017) and Austria (35 percent in April 2016). So, who voted for the AfD and why? Sixty-three percent of AfD voters were men, a far higher gender disparity than any other party’s following. Sexual assaults by asylum-seekers were presented as proof that Germans had reason to fear open borders. But if women feared immigrant criminality, they didn’t express it by voting for the AfD. Indeed, the CDU/CSU – the very parties whose policies were blamed for the rash of assaults – enjoyed the largest gender gap in the other direction. Thirty-five percent of women but only 30 percent of men voted for the CDU/CSU. The gender gap suggests a pattern familiar to societies that have sexually demonized minorities: a claim by men of privileged racial status that white women’s safety depends on the repression of minorities and a gender system in which women rely on men’s protection. White women, however, are more ambivalent than men about that patriarchal order. More broadly, German women have historically been less attracted than men to extremist parties on both sides of the spectrum. The imbalance between the poorer East and the wealthier West was as striking as the gender imbalance. East Germans voted AfD at a rate of 20.5 percent, while only 10.7 percent of West Germans did. It’s tempting to conclude that economically disadvantaged Germans felt betrayed by mainstream politics and thus grasped for radical solutions. But the detailed data are more ambiguous. The AfD did well in districts with both low and high unemployment. A study published the day before the election revealed that 39 percent of AfD sympathizers earned above-average incomes; 29 percent were of middle income. According to post-election data, the AfD captured 22 and 21 percent, respectively, of unemployed and working-class votes – yet 73 percent of AfD voters described their personal financial situation as “good.” Still, they felt disadvantaged compared to others in higher numbers than the electorate as a whole. Anxiety over potential economic hardship may have been as important as actual hardship in forming AfD voters. This would be a striking echo of the findings of sociologist Theodor Abel, who in the mid-1930s examined Nazis who had joined the party before 1933. Some had suffered job loss and economic decline, but far from all. Many had steady employment or small businesses but lived in fear of downward mobility. By their own account, AfD supporters voted in response to deep cultural anxieties. More than 90 percent claimed to be “very concerned” that German culture was being lost, that Islam had too much influence in Germany and their society was losing cohesion. The general electorate was much less concerned about these issues. Ironically, with few exceptions, the regions with the most AfD voters were those with the fewest Muslims, immigrants and asylum seekers. The AfD’s success may, in fact, represent more of a protest vote than a loyal following – albeit a protest vote by Germans willing to approve a xenophobic party in order to register their discontent. Only 31 percent of AfD voters reported voting out of conviction; 60 percent reported disappointment with other parties as their motivation. It may not be long before AfD, too, proves a disappointment. The day after the election, AfD Chairwoman Frauke Petry declared that she would not join the Bundestag as a member of the party’s bloc but rather as an independent. Petry’s move exposed rifts that raise doubts about the party’s ability to function effectively in the Bundestag. On one side are radical rightists who prefer to remain parliamentary outcasts rather than temper their rhetoric. On the other side are “conservatives” like Petry, who admittedly recommended shooting refugees at the border in early 2016 – but whose more recent objections to extremist rhetoric makes her moderate by AfD standards. In the meantime, Merkel must form a coalition in an environment that is radically changed – and not just because of the AfD. In 1949, the founders of the Federal Republic determined that one of the Weimar Republic’s fatal flaws was its system of precise proportional representation. That system had brought as many as 15 parties to parliament at one time, making forming coalitions difficult and giving voters little incentive to reject parties with no serious proposals for governance. The Federal Republic requires 5 percent for representation in Parliament, a stricture that resulted in a concentration of the vote into three to four parties for decades. This was enough to give voters more of a choice than the United States’ two-party system, but a choice among parties that could all be considered as members of a governing coalition. The new Bundestag will have six parties, and fully 21.8 percent of seats will be occupied by the AfD and the Left Party (the heir to the East German Communist tradition), which are excluded from any possible coalitions. The Social Democratic Party promptly declared itself in opposition. Doing so saves them from association with a weakened Merkel and Christian Democratic Union. It also prevents the AfD from becoming the main opposition party, which comes with procedural privileges. The only remaining possibility for a majority coalition then is Merkel’s CDU/CSU, the libertarian Free Democratic Party and the Greens. To call this a challenging prospect is an understatement. The Free Democratic Party and Greens differ profoundly on refugees, the environment, and the EU. The CSU, long frustrated with the CDU’s leftward tilt under Merkel, is inclined to rebuild its right flank after losses to the AfD in Bavaria. This is hardly a recipe for reconciling with the progressive Greens. The Federal Republic has so far been spared government by a minority coalition. Traumatic memories of this unstable form in the Weimar Republic make the prospect unnerving to Germans. Merkel is a skilled negotiator, and there’s a good chance that German “Vernunft” – sensibleness – will prevent the negotiating partners from venturing into such risky territory. And Germans appalled at the AfD’s gains have adopted the hashtag #87percent as a reminder that the vast majority of the electorate remain committed to parliamentary democracy. Yet Germans’ postwar rejection of the radical right was not only a matter of pride. It also expressed a nervous self-reassurance that they had safely cordoned off their most frightening temptations. The electoral showing of the AfD, and the prospect of four years of their presence in the Bundestag, feels like the crossing of a threshold. 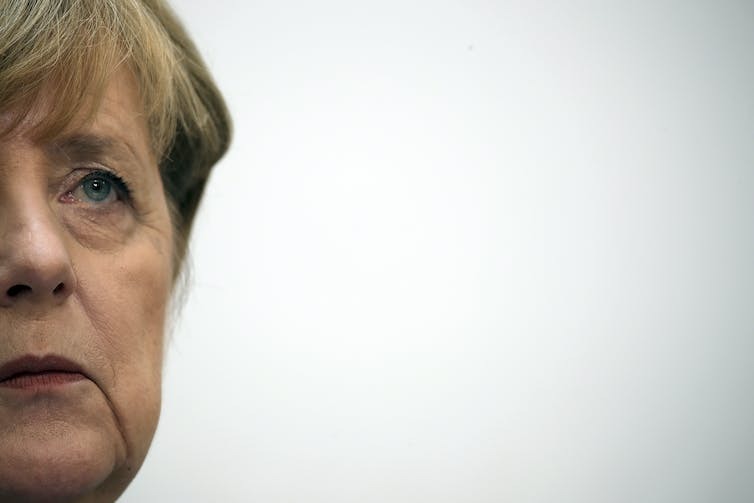 Germany is not headed off a cliff, but something has been lost.